The Electronics Line EL-MDC54 has been discontinued. No direct replacement is available. 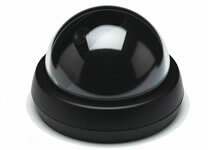 The EL-MDC54 (Series) is a High Resolution Color Mini-Dome camera using the latest Sony CCD and Digital Signal Processor (DSP) technology, the HQ Super HAD, providing the highest quality images. This mini-dome is small enough to remain unobtrusive, and has the ability to mount almost anywhere your application demands it. The EL-MDC54 (Series) offers remarkable sensitivity with an S/N ratio of more than 48dB and is equipped with dual voltage capabilities, 12VDC & 24 VAC, in addition this camera comes with your choice of 2.9, 4.0, 6.0 & 8.0 mm Lens selections for added flexibilities.